"Our students again achieved good results in the 2016 Hong Kong Diploma of Secondary Education Examination. Our rate regarding UniversityEntrance Requirement for degree programmes is 69.4%,"
The results of the HKDSE Examination (2016) showed a remarkable improvement with outstanding results as 70% of our students attained the requirement for university admission (33222) which is far higher than the Territory Average of 42%. The percentage that is eligible to sub-degree programmes (22222) was 97%. The overall subject pass rate was 97% while the percentage of attaining level 4+ was 47%. 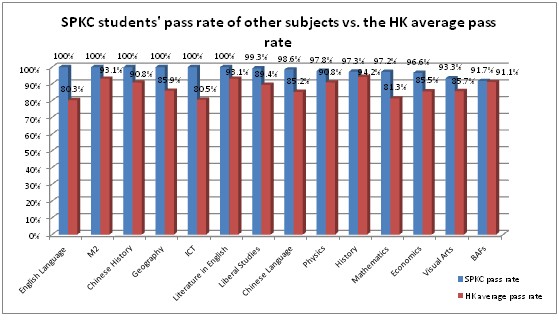 The pass rates of 14 subjects including the 4 core subjects were all above the average in Hong Kong. 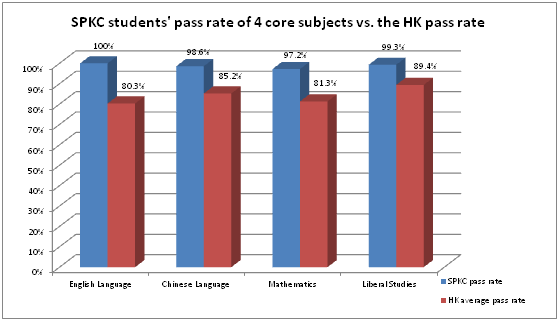 The pass rates of the 4 core subjects were English Language (100%), Chinese Language (98.6%), Mathematics (97.2%) and Liberal Studies (99.3%). Other subjects with 100% pass rates were Module 2 of Mathematics, Chinese History, Geography, History, ICT and Literature in English. 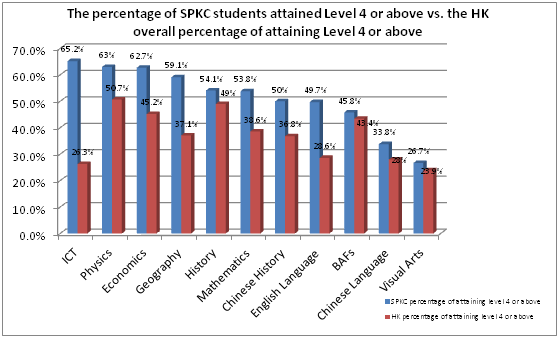 Among these, 11 subjects with higher percentage of attaining level 4+ than those in Hong Kong were the core subjects English Language (49.0%), Chinese Language (32.4%), Mathematics (53.8%) and other subjects including Biology (45.8%), Chinese History (50.0%), Economics (62.7%), Geography (59.1%), History (54.1%), ICT (65.2%), Physics (63%) and Visual Arts (26.7%). GMT+8, 19-4-21 08:27, Processed in 0.255687 second(s), 7 queries , Redis On.